As you park your domains, no doubt you will want to start monetizing them and one of the core advantages of using Dub is its ability to place your own advertising items on your parking sites and pages. Ad Manager is a central place where you can keep all your advertising items. Once you add an ad item via ad manager, you can select this ad on any of your parking site or parking page. Add an ad item by clicking on New Ad Item button on the page and you will see a popup as shown in screenshot 2. You can name this ad item so that you can easily distinguish one item from another. Since advertising items are displayed in certain areas in your parking site and parking pages, we recommend you name it clearly including the advertising item dimensions and type. This will come in handy when you place these ad items on your parking sites and pages. The Ad Code is where you will copy & paste in the advertising code provided by your preferred advertising partners. Some of the popular advertising partners include Google AdSense, yllix, Amazon Affiliates etc. The type of advertising you can display is totally up to you. Many of the above advertising companies usually provide you with a piece of code which you need to embed into your site. But for some, it can just be an image. That's it. You can click Save to save this ad item and after that you will be able to add this to your parking site and parking page. If you want to create your very own banner-image advertising item, you first need to upload this image as an asset via Asset Manager. Once you upload an image, you will be able to reference this image via a URL provided by Dub. With this image, you can now create an ad-item by directly typing in some simple HTML code. For example, the following code will work fine for your ad-item. Updating and deleting ad items work in the same way as many of the other pages available on admin panel. 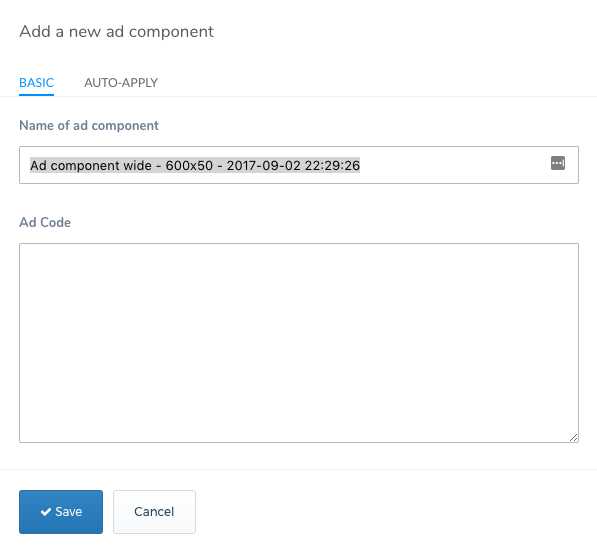 Once you update or delete the changes will also automatically be applied to all the sites and pages that use this ad item.